Demonstrated during the largest display of live running print equipment in the Americas, the paper cutters’ integration of the 2015 Must See ‘Ems Award Winner for management systems ensures a seamless cutting process. “It was only a matter of time before someone linked pre-press to post-press. Scissor Hands and Triumph made this connection,” said Rudi Baldwin, training coordinator, MBM Corp.
A strategic partner since spring 2017, MBM offers the award-winning software on its Triumph machines, the world’s most reliable and safest cutters. 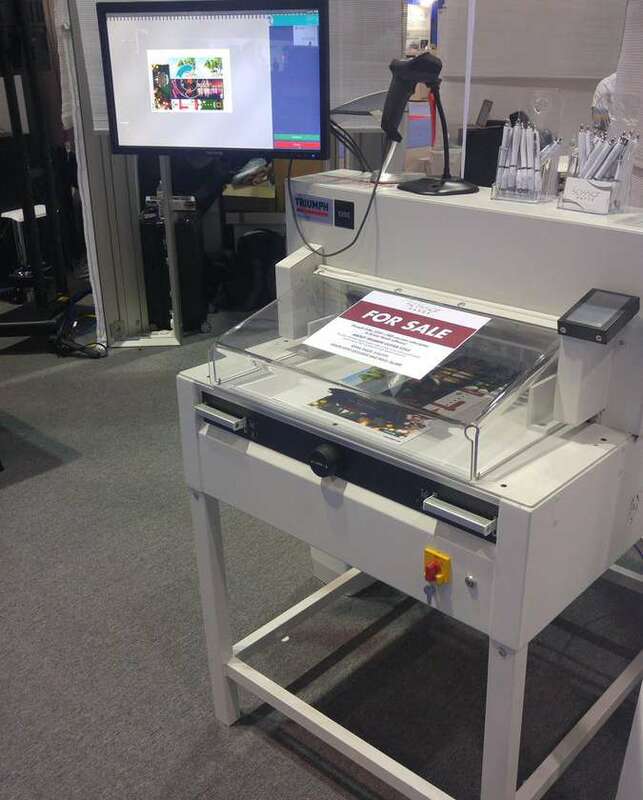 Shown at Print 17 were the Triumph™ 6660 and 5260 Automatic Paper Cutters with patented EASY CUT electronic blade activation bars. Live cutting demonstrations of popular marketing materials, including bookmarks and 4×6 postcards, ran throughout the four-day show. Cutter operators were fully trained on how to follow Scissor Hands’ guided animations on the mounted touchscreen within hours. Step-by-step animated instructions guide cutter operators of all levels through entire runs, both cutting down on training time and lowering labor costs. Cutter operators also handle less product before finishing, reducing cutting errors with overall cutting times decreased by up to 60 percent. Scissor Hands’ advanced technology delivers optimized cut programs that maximize cutting efficiency and eliminate complex manual programming. Its innovative software augments existing guillotine, die cut and laser cutters, making full use of the machine’s capabilities.